I’m glad to hear this. Thank you for responding to the concerns regarding academic freedom. 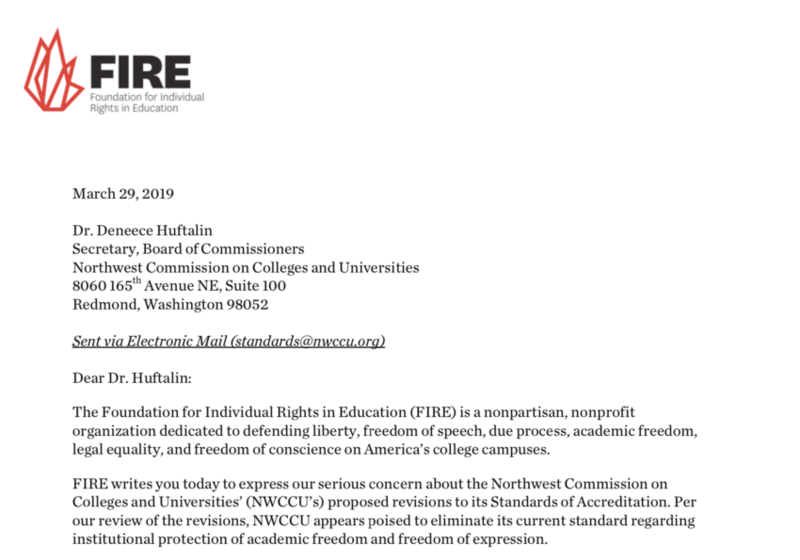 For those from other institutions considering commenting on the NWCCU’s proposed changes to our accreditation requirements, I’ve attached the letters to the NWCCU from the UO Senate and the UO Provost. As you can see these address issues beyond academic freedom, and include such matters as shared governance, research, governing board evaluations, institutional control over transfer credits, student success metrics and their use. I look forward to seeing how the next draft addresses these concerns. For those interested, I’ll continue to update the posts at http://uomatters.com/tag/accreditation with new information. 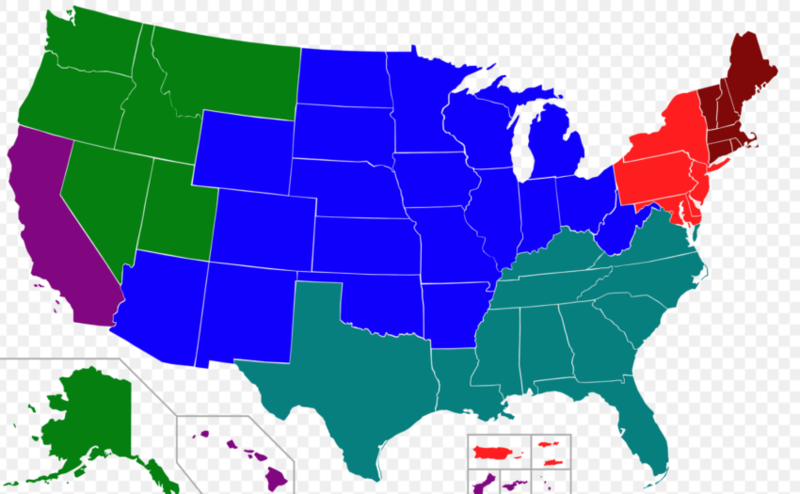 The Wikipedia explanation of how the US accredits universities is here. It’s a mess and it’s about to get way worse for UO. [Next sentences revised with input from a generally reliable commenter.] In a nutshell, senior officials at the Dept of Ed, with advice/review from their accreditation staff in the Office of Postsecondary Education and the National Advisory Committee on Institutional Quality and Integrity, gives 7 [or 6 – NY is a special case] regional bodies authority to accredit the universities, colleges, and community colleges in their regions. top-notch programs prepare students for careers in the automotive industry and the skilled trades. Some career options for these students include automotive mechanic, auto body repair technician, heating and air conditioning technician, electrician, construction worker and welder. The proposed changes eliminate the requirements that, when seeking reaccreditation, UO and other universities demonstrate their commitment to academic freedom, show that shared governance has a role in academic matters, and prove that our faculty and university have control over what transfer credits UO will accept. To register for the Online Town Halls, please visit the NWCCU website’s event calendar at: http://www.nwccu.org/news-updates/calendar-of-events/. But Triplett failed to pass any information to the UO Senate, or apparently any UO faculty or students about the proposed changes to our accreditation standards. The timeline is here. The proposals are here. The deadline for responding to the first draft proposals is March 30th. I found out about this from the AAUP-Oregon on Friday. We have a call in to new NWCCU President Sonny Ramaswamy for Wednesday. I’ve looked at a few of the other regional accreditors and couldn’t find any other proposed changes of this magnitude. The proposed new standards delete the statement on academic freedom and I see no replacement language. 2.A.1 The institution demonstrates an effective and widely understood governance structure with boards or other governing bodies comprised predominantly of members with no connection to the institution and with clearly defined authority, roles, and responsibilities. Institutions that are part of a complex system with multiple boards, a centralized board, or related entities have clearly defined authority, roles, and responsibilities. 2.A.2 The institution has an effective system of leadership, staffed by qualified administrators, with appropriate levels of responsibility and accountability, who are charged with planning, organizing, and managing the institution and assessing its achievements and effectiveness. 2.A.3 The institution employs an appropriately qualified chief executive officer with full-time responsibility to the institution. The chief executive may serve as an ex officio member of the governing board, but may not serve as its chair. 2.A.4 The institution employs a sufficient number of qualified administrators who provide effective leadership and management for the institution’s major support and operational functions and work collaboratively across institutional functions and units to foster fulfillment of the institution’s mission. 2.A.5 Decision-making structures and processes, which are documented and publicized, make provision for the consideration of the views of faculty, staff, administrators, and students on matters in which they have a direct and reasonable interest. 2.C.5 Faculty, through well-defined structures and processes with clearly defined authority and responsibilities, exercise a major role in the design, approval, implementation, and revision of the curriculum, and have an active role in the selection of new faculty. Faculty with teaching responsibilities take collective responsibility for fostering and assessing student achievement of clearly identified learning outcomes. 2.C.8 The final judgment in accepting transfer credit is the responsibility of the receiving institution. Transfer credit is accepted according to procedures which provide adequate safeguards to ensure high academic quality, relevance to the students’ programs, and integrity of the receiving institution’s degrees. In accepting transfer credit, the receiving institution ensures that the credit accepted is appropriate for its programs and comparable in nature, content, academic quality, and level to credit it offers. Where patterns of student enrollment between institutions are identified, the institution develops articulation agreements between the institutions. 1.C.8 Transfer credit and credit for prior learning is accepted according to procedures that provide adequate safeguards to ensure high academic quality. In accepting transfer credit, the receiving institution ensures that the credit accepted is appropriate for its programs and comparable in nature, content, academic rigor and quality, and comparable to credit it offers. WASC (Now the WASC Senior College and University Commission or WASCSCUC, standards updated 2013. The institution protects and fosters academic freedom for all faculty regardless of rank or term of appointment. 4. The institution publishes and implements appropriate policies and procedures for preserving and protecting academic freedom. The institution publicly states its commitment to academic freedom for faculty, staff, and students, and acts accordingly. This commitment affirms that those in the academy are free to share their convictions and responsible conclusions with their colleagues and students in their teaching and writing. The institution has published or has readily available policies on academic freedom. For those institutions that strive to instill specific beliefs and world views, policies clearly state how these views are implemented and ensure that these conditions are consistent with generally recognized principles of academic freedom. Due-process procedures are disseminated, demonstrating that faculty and students are protected in their quest for truth. appropriate professionals with sufficient responsibility to the institution to assure the continuity and coherence of the institution’s educational programs. 3.15 The institution places primary responsibility for the content, quality, and effectiveness of the curriculum with its faculty. Faculty have a substantive voice in matters of educational programs, faculty personnel, and other aspects of institutional policy that relate to their areas of responsibility and expertise. (See also 6.2) 3.16 The system of governance makes provisions for consideration of student views and judgments in those matters in which students have a direct and reasonable interest. SECTION 6: Faculty Qualified, effective faculty members are essential to carrying out the mission of the institution and ensuring the quality and integrity of its academic programs. The tradition of shared governance within American higher education recognizes the importance of both faculty and administrative involvement in the approval of educational programs. Because student learning is central to the institution’s mission and educational degrees, the faculty is responsible for directing the learning enterprise, including overseeing and coordinating educational programs to ensure that each contains essential curricular components, has appropriate content and pedagogy, and maintains discipline currency. 4. The institution (a) publishes and implements policies on the authority of faculty in academic and governance matters, (b) demonstrates that educational programs for which academic credit is awarded are approved consistent with institutional policy, and (c) places primary responsibility for the content, quality, and effectiveness of the curriculum with its faculty. The institution’s faculty exercises effective academic leadership and acts consistently to ensure that both academic quality and the institution’s educational purposes and character are sustained. The institution clearly defines the governance roles, rights, and responsibilities of all categories of full-time and part-time faculty. Tagged accreditation, Charles Triplett. Bookmark the permalink. Do you have a link that describes how DeVos is putting pressure on the accreditors to do this? The changes — e.g. forcing UO to give transfer credit for CC courses that really may be high school courses; weakening of shared governance — sound like things the Oregon legislature would love — they are already doing the former. There is a lot of dissatisfaction with higher education emanating from the right, and increasingly, the left as well (though over somewhat different things). But, if there’s a link about what DeVos is really up to, I’d like to see it. President Trump, through his Education Secretary Betsy DeVos, is proposing a series of changes to what colleges and their accreditors can do including changing what a college “instructor” is, allowing anyone on an “instructional team” to teach an online class, regardless of their expertise or experience or credentials. As ideas go, that’s an awful one. And you may think it’s difficult to top. But allowing schools to turn teaching over to non-teachers is not nearly the worst idea now being considered by the Trump Department of Education (ED) in what’s called negotiated rule-making – negreg. One proposal under review would allow schools that offer online classes to outsource half of those classes to unaccredited entities without approval from anyone, and another proposal would remove any supervision of how schools deliver the college credit hour. Requirements for accrediting agencies in their oversight of member institutions and programs. Criteria used by the Secretary to recognize accrediting agencies, emphasizing criteria that focus on educational quality and deemphasizing those that are anti-competitive. Simplification of the Department’s recognition and review of accrediting agencies. 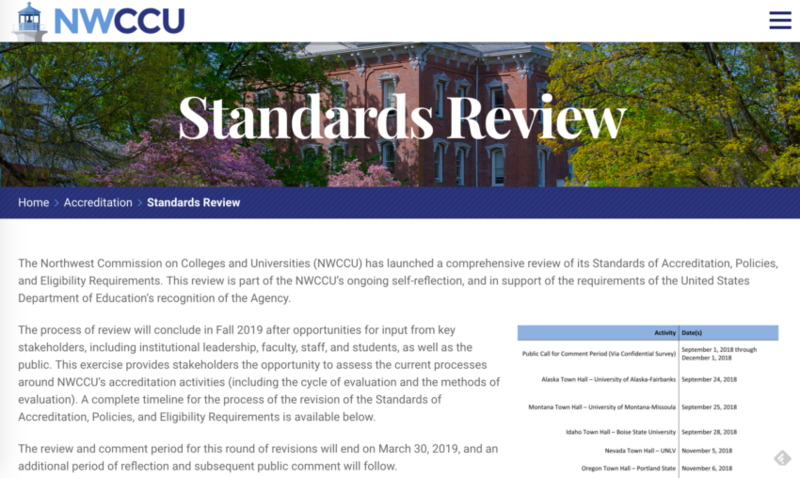 Clarification of the core oversight responsibilities amongst each entity in the regulatory triad, including accrediting agencies, States, and the Department to hold institutions accountable. Clarification of the permissible arrangements between an institution of higher education and another organization to provide a portion of an education program (34 CFR 668.5). The roles and responsibilities of institutions and accrediting agencies in the teach-out process (34 CFR 600.32(d) and 602.24). Elimination of regulations related to programs that have not been funded in many years. Needed technical changes and corrections to program regulations that have been identified by the Department. mortar and distance education programs; enable expansion of direct assessment programs, distance education, and competency-based education; and to clarify disclosure and other requirements of state authorization. Protections to ensure that accreditors recognize and respect institutional mission, and evaluate an institution’s policies and educational programs based on that mission; and remove barriers to the eligibility of faith-based entities to participate in the title IV, HEA programs. TEACH Grant requirements and ways to reduce and correct the inadvertent conversion of grants to loans. Simplification of State authorization requirements related to programs offered through distance education or correspondence courses, including disclosures about such programs to enrolled and prospective students and other State authorization issues (34 CFR 600.9 and 668.50). The definition of “regular and substantive interaction,” as that term is used in the definitions of “correspondence course” and “distance education” (34 CFR 600.2, 600.7, and 668.10). The definition of the term “credit hour” (34 CFR 600.2, 602.24 and 668.8). The requirement that an institution demonstrates a reasonable relation between the length of a program and entry-level requirements for the recognized occupation for which the program prepares the student (34 CFR 668.8 (e)(1)(iii) and 668.14(b)(26)). The barriers to innovation in postsecondary education and to student completion, graduation, or employment, including, but not limited to, regulatory barriers in the Department’s institutional eligibility regulations and student assistance general provisions (34 CFR part 600 and 34 CFR part 668). Direct assessment programs and competency-based education, focusing on the ability of institutions to develop, and students to progress through, innovative programs responsive to student, employer, and societal needs, including consideration of regulations that are barriers to implementation of such programs, such as certain requirements for term-based academic calendars and satisfactory academic progress. 2. The topics that the TEACH Grants Subcommittee is likely to address include, but are not limited to: The simplification and clarification of TEACH Grant program requirements to minimize the inadvertent grant-to-loan conversions and to provide opportunities to correct erroneous conversions (34 CFR part 686). 3. The topics that the Faith-Based Institutions Subcommittee is likely to address include, but are not limited to: Requirements for accrediting agencies to honor institutional mission and various provisions of the regulations regarding the eligibility of faith-based entities to participate in the title IV, HEA programs, including the Gaining Early Awareness and Readiness for Undergraduate Programs, and the eligibility of students to obtain certain benefits under those programs (34 CFR 600.11 and parts, 674, 675, 676, 682, 685, 690, 692, and 694). These subcommittees will address the specified issues and make recommendations to the committee. Subcommittees are not authorized to make decisions for the committee. The subcommittees may be comprised of some Accreditation and Innovation Committee members (negotiators) as well as individuals who are not committee members, but who have expertise that will be helpful in developing proposed regulations. Therefore, in addition to asking for nominations for individual negotiators who represent key stakeholder constituencies for issues to be negotiated to serve on the committee (see Constituencies for Negotiator Nominations), we are asking for nominations for individuals with specific types of expertise to serve on one of the three subcommittees (see Areas of Expertise for the Distance Learning and Educational Innovation Subcommittee, Areas of Expertise for the Faith-Based Entities Subcommittee, and Areas of Expertise for the TEACH Grants Subcommittee). The subcommittees’ meetings will be held between committee meetings (see Schedule for Negotiations and Subcommittee Meeting). Before the conclusion of the negotiations, each subcommittee will present any recommendations for regulatory changes to the Accreditation and Innovation Committee for its consideration. Only the committee has power to reach consensus on regulations. My apologies–I misspoke. I was specifically asking if there is a citation for DeVos (or Trump) pushing to delete the “academic freedom” language (your first objection, which I also object to). Such a push would seem to be in contradiction with Trump’s recent Executive Order requiring public universities to adhere to First Amendment free speech principle “or else”. Apology accepted. Your penance is to google this question and post a summary of what you learn, with relevant links. Perhaps ironically, the top hit is literally this blog post. Couldn’t find much else that looked relevant, though admittedly my skills are weak. As a first thought, I’m guessing that Trump doesn’t spend much time thinking about academic freedom, for or against. As for myself, it seems more meaningful when there’s a wide array of viewpoints being espoused on campus. If there’s a monoculture, what does it really matter? Try clearing your search history. This seems like a completely predictable outcome, regardless of any prompting from the Trump administration. I’ve been a member of consensus-based, standards-writing organizations in the past, and observed that while participation is theoretically open to all, in practice only those who can put in enough hours can effect policy – that is, those who are essentially paid to participate. In this case, that is administrators: of the 20 Commissioners of the NWCCU, 17 are presidents or chancellors, 2 are other administrators, 3 are public members, and only one is a faculty member (and a professor of management information systems, to boot.) Administrators can commit the time to do this work, while faculty have day jobs that tend to take over their schedules. If an accreditation body is overwhelmingly run by administrators, of course its policies will reflect the worldview of administrators, who as a class, have come to regard shared governance as a quaint nuisance. I’m a bit surprised by the disregard for academic freedom; one would think they would at least preserve a fig leaf of regard for this. However, I think Anonymous above is confusing academic freedom with freedom of speech. The Trump administration wants to make sure that Anne Coulter can come make a ruckus on your campus; I’m sure they don’t care at all whether a faculty member is being harassed for disseminating unpopular ideas. Disclaimer: Nothing in this comment is meant to assert that there is anything pseudo-scientific about chiropratics, naturopathics, or astrology. Use this, my response, as the vehicle for those assertions, then. This is small potatoes compared to the dismantling of shared governance, reduction in academic freedoms, massive increases in time-consuming, administratively-mandated busy work and a near complete takeover of decision-making by our own Administration. It is easier to complain in vain about some outside “dark force” and much harder to actually wage the good fight to get back what this University needs: integrity, values and direction. Maybe the Senate and the Faculty Union (this blog’s writer in heavily invested in both) should focus on what they can change internally rather than pointing rather limp fingers at external, untouchable gremlins. One place to start is to strongly support the GEs, OAs, NTTFs and classified staff who are going to get shafted in the very near future. Yes, but it is still worthwhile to point out and understand the context in which we operate. The concerns we have are not unique to the UO, but are just the local expression of these national (and international) trends. There is a large class of itinerant administrators, who move from institution to institution, barely noticing where they are, bringing the new “best practices” with them. Might some private religious colleges feel constrained by the current protection of academic freedom? If this accreditation standard is deleted, private colleges could require faculty to teach according to their scripture and not risk losing accreditation on that score. I’m guessing both Sun Tzu and Canard are right: we’ve got to see where we (still) have some power and make sure we exert some energy there while being mindful of the larger context, which in this case, means we’ve got to make sure HECC and the State make a strong stance for academic freedom and inclusion of faculty on all decision-making subcommittees, given the pressures coming down federally, and creeping into accreditation bodies. But yea, if we don’t support our lowest-paid workers that keep this place going, and the State’s financial outlook continues to worsen long term, then we’re sol, and heading into an even bigger clusterxxxx. apt et. al. : I agree, and it could be useful if faculty of all Oregon schools (public and private?) as well as OA, Staff, GTF(GE), NTFF, go to Salem to be heard, not about salaries or money, but rather just on shared governance. As Sun says the current crop of admins, and board members and their handlers are less academic and more (um, er…) technical. It seems and may well be that they do not understand or even know what shared governance is and means (I will put a list of useful links below). I am pretty sure that the Oregon constitution still enshrines the values of transparency and integrity, that we citizens still demand (and may be why we choose to be in Oregon), and legislators may want to protect. Perhaps we remind ourselves this protection demands work, involvement, integrity, and transparency as well. Thanks for these very helpful links! Triplett and the UO central administration knew about this well before December, for sure. Has Mike Schill made any response or statement about this? He may have done without my realizing it, though I suspect UOM would know if he had. If he has not, and he hasn’t been working vigorously and demonstrably behind the scenes to push back on this proposal, then I’d call this a perfect occasion for a Senate vote of no confidence in this administration. For this and all the reasons Sun Tzu just mentioned. http://www.aauporegon.org/urgent-request-to-protect-academic-freedom/) Way to go faculty and our allies!